Kombucha is kind of a favorite around our home. When the kids see it in the fridge, they flip out and beg to have some. But herbal kombucha is another animal entirely…and an exciting one (at least to me!). By the way, if you’re not familiar, check out the Kombucha FAQ, or my kombucha video. I’ve been pregnant and/or nursing for about the last 10 years straight. (Yes, this is relevant!) That can really take a toll on a person, and I’m determined not to lose my health to all my babies. I need us both to be healthy. Plus, we do honestly hope for more down the line, so I need to be healthy enough to carry another baby. One of the ways that I protect my health is through drinking an herbal infusion of red raspberry leaf, nettle leaf, and dandelion leaf. The latter two herbs are super nourishing, filled with tons of vitamins and trace minerals. The former is also nutrition-packed, and also especially good for women’s health (it relaxes smooth muscles, meaning fewer cramps and a more toned uterus during birth). It can promote hormone balance as well. But, I have so many things I was wanting to drink daily. My herbal infusion. A smoothie with coconut milk and superfood powder. Kombucha. Plenty of water. And…. It feels like the list goes on. Then I thought…what if I could combine the herbal infusion and the kombucha…and make kombucha out of those herbs?! A quick internet searched confirmed it was possible because those particular herbs (dandelion, raspberry, and nettle) are high in the tannins needed for kombucha, but low in volatile oils (which can harm the SCOBY used to brew). But, there was little additional information. I decided to just go for it and figure it out as I went along. Well. It does work, and it is yummy, and it is beneficial in brand new ways. I’ve been making it for about 6 months now, and my SCOBYs from my herbal brew are nice and strong…possibly even stronger than my regular black tea brew! I’m sharing it with you now so that if you’re ever in my shoes, you won’t have to fumble around and hope you find a way. Here’s what you need to know. Herbal kombucha, in addition to combining some of my favorite herbs and my favorite naturally bubbly drink (WIN), has benefits in and of itself. Regular kombucha, while beneficial (and I love it) contains some caffeine. How much, I don’t know — some say that the SCOBY breaks it down in the fermentation process; others say it doesn’t. Herbal kombucha, of course, does not contain caffeine. Basically, they’re super-nutritious! They’re packed with basically everything that isn’t fat-soluble (you’ll have to go for cod liver oil for those). There are several different herbs that you can use with this. You can use them alone, or in combination. I have done it several ways. You don’t want to use anything that’s high in volatile oils because this could damage the SCOBY. If you want any of these flavors, add them to your second ferment, not your first. All of these would be good in a second ferment. They would add really nice flavors. You could try making a simple syrup with mint tea, or steeping citrus peels as “tea” and adding that. I haven’t tried this yet, but ideas, ideas…. The interwebs were really unclear about this part. When you make a standard cup of black tea, you usually use 1 teaspoon of tea leaves to 8 oz. of water. But when you make herbal tea, it’s not uncommon to use a tablespoon or two of tea leaves to 8 oz. of water. It’s typically stronger. It’s also typically steeped longer because while black (and green) tea will become very bitter if steeped too long, most herbal teas don’t do that. So how is one supposed to measure for kombucha?! For my herbal kombucha, I have been doing about 1/2 cup of my herbal tea leaf blend for a single gallon. I have tried as little as 1/4 cup and as much as nearly 1 cup, and it has not seemed to make a big difference in flavor, SCOBY health, etc. I like it a bit stronger, because it has more tannins in it (good for SCOBYs), and because it will have more concentrated nutrients. So, I’d recommend using about 1/2 cup of tea leaves per gallon. I have tried a blend that is raspberry leaf- nettle leaf-dandelion leaf. I have done plain raspberry leaf (the SCOBY seemed to really like this). Another blend I have done is raspberry leaf-nettle leaf-dandelion leaf-catnip-rooibos. Others have done plain rooibos. There are many ways to do it. If you’re doing plain rooibos, I’d use less of it, more like 1/4 cup of leaves to a gallon, because they’re more tea-like. In a medium-sized saucepan, add about 1-quart filtered water, 1/2 cup of your tea blend, and 1 cup of organic sugar. Bring it to a boil. Turn it off, and let it sit and cool for at least 30 minutes. It’s also steeping and getting stronger at the same time. Strain the tea blend and pour into a 1-gallon glass jar. I just put my mesh strainer over the glass jar and do this in one step. It’s really important that it’s cool, around room temperature when you do this, so you don’t hurt the SCOBY. To this, add your starter kombucha and a SCOBY (use, ideally, at least 2 cups of starter kombucha for a consistent brew). Get one from a friend, or buy one online. They are on Amazon and basically everywhere now. You can use regular kombucha and a regular SCOBY to do this — I transferred one from my black tea jars to this herbal jar, initially. Now I have SCOBYs that were always grown in my herbal jars. Secure a loose cloth or coffee filter over the top of the jar to keep out the bugs, and set this aside for 10 – 14 days. This is so easy, right? Seriously, it is! And I love kombucha because it doesn’t need something from me daily. If it’s “bottling day” and I get busy, I can do it the next day, or the next, and it isn’t ruined. Other projects you have to be much more careful of and they need regular attention daily, or they don’t work. I don’t have time for that. So, it’s been 10 days…or 14…or 21…who’s counting? Kombucha is actually pretty flexible, so no worries if you let yours sit a bit too long. Some people choose to let theirs sit for a full month, so you’re good. Unless you see fuzzy mold or fruit flies in it, then no — don’t drink that. But if you brew it correctly, that won’t happen. I have had fruit flies a few times, but I have never had mold, and I’ve been brewing for 7+ years. It isn’t that common unless you leave it to sit for months or don’t get enough starter kombucha in it. You can totally just remove the kombucha from the jar and drink it right away. That is perfectly fine, and faster. But you might want to add some fun flavors and make it more bubbly, and that requires a shorter second ferment. Use old store-bought kombucha bottles, or buy the flip-top style bottles available at brewing companies. You can also use mason jars, but since they don’t seal tightly you won’t get as many bubbles. Be creative. Aim for 1 – 2 oz. juice in 14 – 15 oz. of kombucha, with exception of lemon/lime. You don’t need too much of that because it’s so strong. Add all your flavoring items to your bottles. You should get 7 bottles out of a gallon of kombucha so that you have enough left over to restart it. Then, pour in your kombucha. Seal your bottles tightly, and set them aside for 3 – 4 days. After that, transfer them to the fridge. Restart your kombucha just like you did the first time! See? How easy is that! Really! The picture above is my raspberry/dandelion/nettle herb blend with lemon juice. When I include rooibos tea, it’s darker like regular kombucha. Feel free to get a little creative with your tea varieties and flavors, and enjoy! 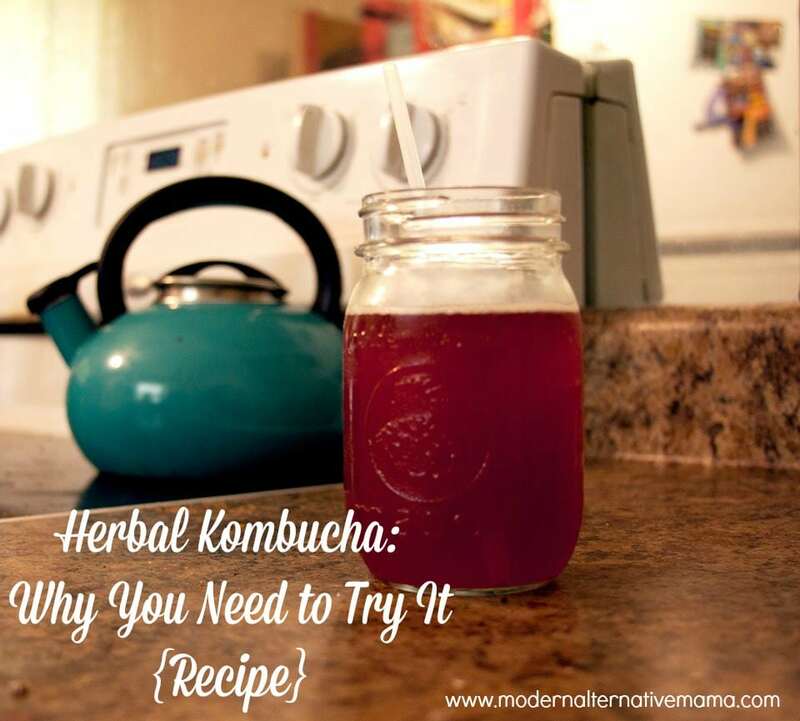 Have you ever made herbal kombucha before? I’ve often thought of making an herbal kombucha, but never got around on it. I really should get back to brewing my own kombucha because this sounds amazing. I have been brewing about 5 years using only herbs! I usually start with rooibos and add other herbs here and there. I think it tastes even better than when made with black tea. I’ve always wanted to try herbal kombucha, but I was afraid that it would ruin my scobys. Totally trying it now! Thanks! I want to try this. How much of each herbal tea do you use? Equal parts? Thanks so much for sharing! I’m brewing up my first herbal batch now! Have you ever tried making Jun? Or brewing with honey instead of cane sugar? I’ve started the process but I’m a bit confused. Should I have a gallon of liquid? Your recipe says a gallon per 1/2 cup of tea but it only says to boil 1 quart of water and add two cups of starter. That’s nowhere near a gallon- confused! !